The Clermont 4 Carat Radiant Emerald Cut With Channel Set Baguettes Cubic Zirconia Solitaire Engagement Ring will amaze everyone with a stunning 4 carat 10x8mm diamond look radiant emerald cut center set in a basket setting. The Clermon makes for an amazing solitaire engagement ring, especially if worn with a complimenting anniversary band or wedding band. Diamond look channel set baguettes are set halfway down both sides of the band in a modern and sleek styling. 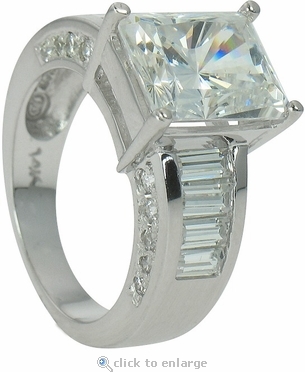 The man made lab created diamond look cubic zirconia radiant emerald cut has 104 sparkling facets that are beautifully complimented by the channel set baguettes. 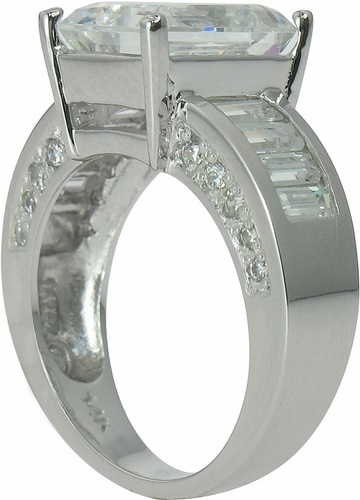 Additional diamond look rounds are pave set on both vertical sides of the band for that extra sparkle. 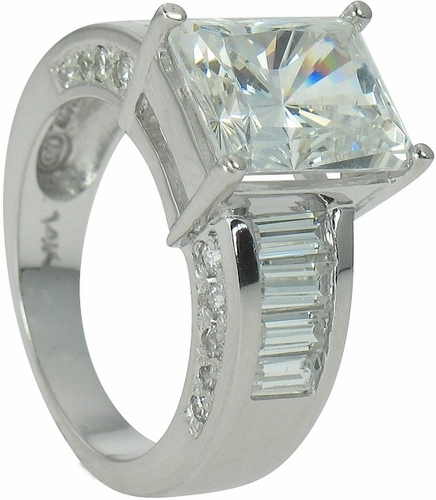 The band measures approximately 5.75mm in width and includes a total of approximately 5 carats in total carat weight of the finest hand cut and hand polished original Russian formula cubic zirconia. For further assistance, please contact us at 1-866-942-6663, option 1 or visit us online via live chat, and speak with a live representative. This item is a clearance item. Due to extremely low pricing, all clearance items are a final sale. Ring can be sized for an additional fee. See menu options. Sizes below a 5 or above an 8 available via special order.